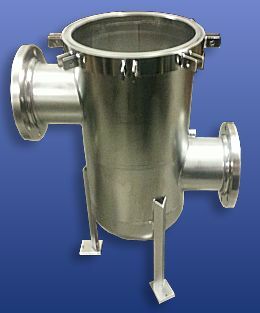 High flow steam filter applications are unique when compared to a typical single vessel steam filter applications. Most high flow applications use lower pressure steam for safety purposes. The High flow and low pressure typically used requires that a large or multiple filters be used to effectively filter the steam while maintaining a low pressure drop. High flow applications normally require large pipe connection sizes. The typical large single element steam filter has a limit to the steam capacity and inlet/out size it can handle prior to needing to use two, or more, filters in series. Filtering in series can be very expensive due to the number of housings being purchased as well as the connection piping pre and post filter assembly. protect valves, process equipment and process filters from damage. Similar to Micropure’s standard steam filter, our high flow steam filters use our patented woven stainless steel filter media – supported by stainless steel segmented discs. The picture to the right shows the difference between the two types of media. Our media (top picture) traps all particles upstream on top of the media. The standard element from a competitor’s filter traps and absorbs the contaminates introduced by the steam source. Unlike other filters that have a shorter life and must be disposed or removed frequently for acid cleaning, MICROPURE filter media can be easily and repeatedly cleaned by backflushing for a full year under normal use. When replacement finally becomes necessary, the cost is considerably less than our competitors. The reason: only the media is replaced, not the entire element. MICROPURE has the filter size you need from 10 lbs/hr to 100,000 lbs/hr (at 100 psi, 1 um grade). Micropure has filters with micron rating from 1-100 to ensure that your exact requirements are met. Case Study: The Highs and Lows of Fermentation Filtration: There were several unique problems that this application provided to the client. The first was the high flow rate of steam needed for the fermentation process as well as the sanitation process. The high flow was combined with a low pressure.